Most of us never consider the concept of freedom, but many, in the strangest of circumstances, have never been allowed to reach it. Folle embellie applies the concept of freedom to the beginnings of the Nazi invasion of France in WWII. It begins at an insane asylum as the first bombs drop. The gate is opened and a few inmates wander out and join the world. But the film creates an unintended paradox: by letting loose those who need serious help, are they really gaining freedom? A family escapes from the asylum: Fernand, Alida, and their son Julien. Julien is here by circumstance; his parents are patients, and he was born during their treatment. The mother, Alida, suffers from anxiety, and she landed in an institution because she once wound up alone with a stranger and tried to kill him. She is already “cured” and has only been staying on to keep Julien close to his father. The way the family is introduced and how we first experience them is elusive and engaging. We don’t know they’re related. Fernand and Alida share a tense moment early on, but for a moment I thought Fernand was a doctor. Julien seems like a hired hand caring for the horses. When the three escape, Alida and Julien together, Fernand on his own, we don’t yet know their dynamic. Only when, later on, they address each other as ‘mom’ or ‘husband’ do we understand. Fernand is the sort who typically belongs in an asylum. Possessing delusions of grandeur, he at times imagines he is head of a kingdom, as when he lifts a fallen tree and walks among the treetops, at other times the patriarch of a holy family, and at other times still he acts as a true leader of this wild group who wanders the French country side. Jean-Pierre Léaud plays Fernand and though his performance comes off too strong at first, he is allowed some real moments of lucidity and depth. He is also very funny, as when be banishes the uncouth Hélèna from their band. The outcome of his authority isn’t so funny. Hélèna hangs herself. The director advocates freedom for all. So do I. Dominique Cabrera once had a summer job at an asylum where she heard of this story and argues that the film is a magical utopia for its characters. While they do find physical freedom, the paradox seems to be that these people, each to a different extent, are trapped by their illness. Can freedom be achieved for those who are mentally ill? Perhaps I’m thinking more into this because of the WWII setting and the Nazis had a strict policy against the insane, but these characters cannot escape the fate of their condition. Alida is a perfect example. A fascinating character, she appears perfectly sane. We at first don’t realize she has mental problems. When she spends the night with the boater who is not her husband we see her panic, but this panic can be attributed to the situation. Later the group of escapees finds refuge as farmhands. Praised for her delicious panettone, Alida is asked at dinner to sing an Italian song. Her anxiety sets in: instead of singing, she sabotages their efforts by admitting to her new employer that they have escaped from an asylum, and she insists they are not dangerous. They are all let go. By admitting the truth when the idea was not even hinted at by the employer, I make the case that Alida may not be capable of enjoying her freedom. This is not a fault of the film. There are great intellectual discussions to be had regarding Folle embellie. After the fact the film is very engaging. The trouble watching it is that the film is not terribly interesting. While I was never bored, I kept waiting for the ending as these characters stumbled onto each new situation. This is a road movie without wheels. They first take the aid of a man with a boat, then they stumble onto an empty house. In these scenes the group seems to have found happiness. But then they have to leave and they go somewhere else. I can’t claim the film fails dramatically. Episodic films usually don’t appeal to me. I find it hard to focus when a film constantly asks me to shift scenarios, even when we’re following the same characters. On the flip side, many of my favorite films develop in short bursts, little stories like separate chapters in a book. 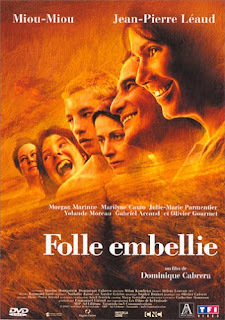 Something about the storytelling in Folle embellie did not tie together for me. I was never really interested in what was going to happen next, though the photography is stunning and the performances so enjoyable that I stayed with it until the end. Morgan Marinne as the son was by far the most impressive actor. Perhaps his character was the most interesting. I should accuse myself of dismissing everyone else because their characters were, to me, simply crazy and therefore there was nothing beyond the surface to look at, so this is another point in favor of the film. Julien, the son, was fascinating, partly because Marinne is an intense young actor, but also because we know his father and mother and I kept wondering how he felt being their son. Is he embarrassed? Is he filled with fear of becoming like them? Does he feel obligated to them because of their issues? Does he resent them? The film addresses all these questions, and in a way the center of the story falls on him and for that I was grateful. But not even he can truly embrace freedom. When his mother sabotages their future job security, when once Julien declared to his father that he will leave them and live for himself, Julien now follows his family out of the farm and into the unknown. Perhaps Cabrera was consciously aware of the paradox she had created with this film. 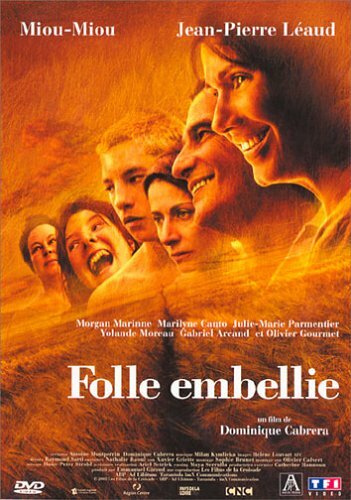 Like the idea of freedom in Kieślowski’s Blue, freedom is presented in Folle embellie in a very curious way, least of all setting the film during France’s entry into WWII. A lot depends on the ideas of the individuals watching the film. Though it is nice to imagine that everybody can be free, I believe these characters are ill-equipped to handle it. And while the structure of the film is intentionally aimless, I found myself mostly uninterested as the material unfolded.